My boyfriend has literally dragged me out of the bed on numerous occasions when I’ve refused to leave the bed and leave myself with only minutes to get ready for the day. This obviously doesn’t leave me a whole lot of time to do a full face of makeup. Anyone else relate to this situation? I’m going to take a wild guess that you do. A lot of us are stuck in our beds way after the alarm goes off, gets ready in a rush, and then leaves at the last minute to get to work on time. I’m basically an expert at this. So, I’ve developed a makeup look that is stunning while also not taking up my 15 minutes of get ready time. 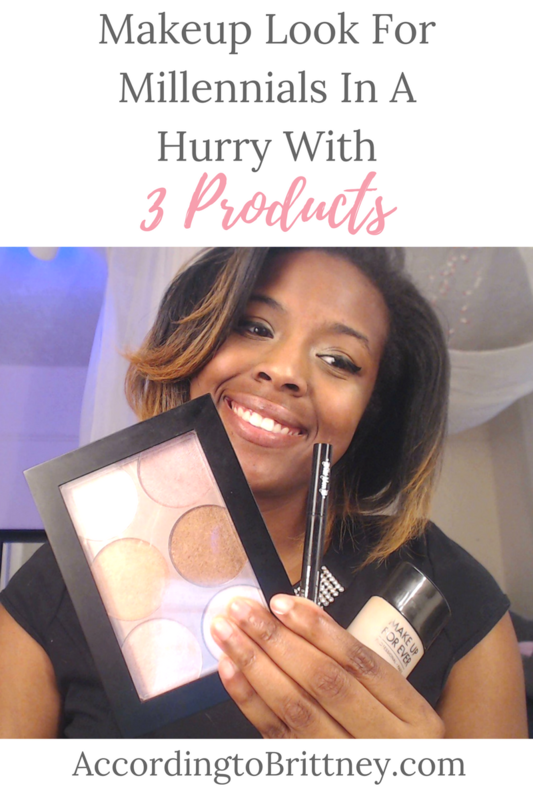 The best part is: I only use three products to complete the look (with the exception of skincare, brushes, and sometimes setting spray). These three will get you through the day! So, let’s dive in, shall we? This is an important step that even the most makeup savvy person forgets (I’m guilty of it!) But having healthy skin under a fresh coat of make-up is so important. Your skin will thank you! I got the pleasure of learning about a homemade skincare brand right in Cleveland called Bee Basic. They have everything from lip balms, to toners, to moisturizers (for my dry, dry skin). I start my routine by cleaning my face usually with a makeup remover wipe from Forever 21. Then, I moisturize. Next (thanks to Bee Basic educating me), I spray on some of their Magic Toner to refresh, moisturize, and protect my skin. Bonus: all products are homemade and perfect for sensitive skin! Foundation is exactly how it sounds. It’s the foundation of your whole makeup look.When I apply, I only put the foundation on places on my face that I believe need it (nose and under eyes). I also think it helps looks more natural. I use Makeup Forever Foundation for my signature look. Eyeliner is the most important part of any look, imo. It’s like the signature to this signature look. I love Kat Von D’s eyeliner with all my heart. Kat Von D Tattoo Liner in Trooper – Love, love, love this. It’s probably my favorite product that I literally wear everyday. I have always loved eyeliner. My mom used to call me a raccoon because I used to basically cover my eyelid with it. So, I’m very particular about what I use. But, this product is my absolute favorite. It’s the blackest black I’ve ever seen, easy to apply, and stays on all day. What more could you ask for? I love to highlight!!!! I thought eyeliner was my best friend, but I learned that I could have two best friends. The other being highlighter. The key to this look is that I not only put the highlighter on my cheeks and nose for extra shine. I put a little in the corners of my eyes to complete the look! It makes my eyes look brighter, almost mimics eye shadow without all the work, and is easy to do in a little time. Sephora Luminizing Palette – I love this palette because it’s a palette. It provides so much variety on how I will light my face that day. It has some gorgeous gold shades, a couple pinks, and a white for when you’re feeling fancy! I think each shade looks really good on my skin tone which is always a plus! This look is one of my favorite makeup looks especially when I’m on a go. It’s easy and only takes a few steps! Busy women like us need a signature look that keeps us from being late! What’s your favorite product for a quick and easy look? Comment below!